Research suggests that redirecting ground reaction forces relative to the knee joint’s rotational center, thus decreasing risk factors for medial compartment osteoarthritis, can be achieved by repositioning the foot through a number of different mechanisms. The economic and societal impact of lower extremity arthritis is a staggering $171 billion per year in direct medical care and job related costs of $13.2 billion per year.5-8 Due to the vast burden of this disease on the U.S. healthcare system, the National Institute of Arthritis and Musculoskeletal and Skin Diseases has identified knee OA as a primary area of research. Much of the research for the past 20 years has been focused on the biochemical and metabolic processes of cartilage damage and repair. Despite these great efforts, treatment of knee OA remains largely palliative, focusing on oral analgesics and often ending in destruction of the joint and an artificial knee implant. Researchers have only recently returned to investigating the biomechanical pathology that underlies much of the disease progression. What those researchers have discovered is beginning to change the way we think about joint loading, the influence of the foot on lower extremity mechanics, and even our notions of footwear. Figure 1a. Ground reaction force (GRF) vector pointing to body center of mass. 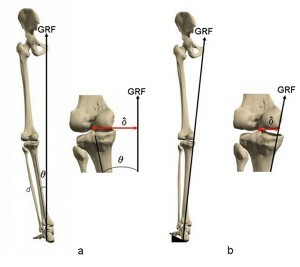 The force is at a distance from the rotational center of the knee joint, producing an external adduction moment of force. Figure 1b. A valgus wedge under the foot can produce a decreased knee adduction moment by altering the GRF vector, reducing the moment arm. 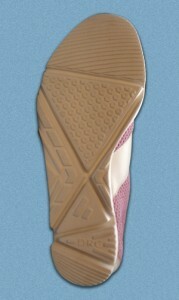 The ground reaction force vector originates at the foot-ground interface during the contact phase of gait. So if one wanted to manipulate the position of the ground reaction force vector, the foot-ground interface or plantar aspect of the foot would be a great place to start. The magnitude of the ground reaction force vector is largely dependent on gravity and body mass, both of which are notoriously difficult to influence. However, the direction or position of the ground reaction force vector with respect to the joint rotational center can be manipulated. One method used by clinicians for many years is the introduction of a valgus wedge under the foot.20 The theory is that the valgus wedge slightly alters the orientation of the ground reaction vector, thereby placing it closer to the rotational center of the knee joint axis. (Figure 2) Several studies have confirmed a decrease in the peak knee adduction moment associated with either valgus wedges or valgus posting in a foot orthosis.21-23 Studies by Davis et al showed there is a dose dependent response to the wedge in that the minimal amount of wedge valgus angle that provided the maximum reduction in pain was patient-specific. This suggests that determining the optimal angle of the valgus wedge post for each individual patient’s foot orthosis may be the appropriate approach to reducing knee pain and loads across the medial knee in OA.24-26 It is important to keep in mind there have been several studies that show valgus posting or wedges have little beneficial effect on the progression of knee OA.27-29 Clearly continued research is needed to better understand the role the foot in the mechanics of medial knee OA. 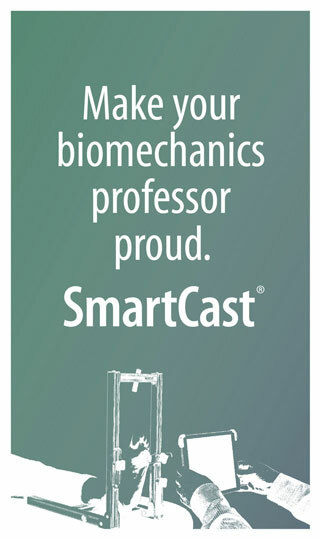 Over the past few decades, the work of this author and others at Rush University Medical Center in Chicago has evaluated the effects of various interventions on the biochemistry, anatomy and biomechanics of medial knee OA. Through controlled trials of hundreds of individuals, we have seen significant long-term beneficial effects of manipulating the foot ground interface in some patients and observed others in whom the modifications seem to provide no significant beneficial effects. For those that did complete a multi-year intervention, there was a statistically significant reduction in the loads at the medial knee and reduction in pain.30 Focus soon turned to the question of what allowed the valgus wedge to work amazingly well in some subjects with medial knee OA while others seem to get little benefit. Given these findings and findings from previous work that show a varus posted device increases the peak knee adduction moment, there may be translational value to this knowledge.34 If one can clinically observe greater frontal plane motion of the rearfoot and leg in a subject with medial knee OA, there may be a greater likelihood of reducing the medial knee loads by using a valgus foot-ground intervention. However if there is more transverse plane motion observed in the leg with foot pronation-supination, then other treatment options may be better. While researchers continue to work through the multiple possibilities between interventions and patient mechanics trying to scientifically understand the role the foot has the progression of the disease, it remains evident that the foot-ground interface plays a role in medial knee OA. Figure 2. To measure the amount of lateral displacement of the COP trace, we determined the widest part of the forefoot and rearfoot, found the midpoint and connected a line to each midpoint. This was labeled as the longitudinal axis from which the distance of COP trace was calculated. The most direct measurement of the foot ground interface is plantar pressure measurement. This is done either with electronic in-shoe sensors or with an electronic sensor array the barefoot subject walks over. Several studies have shown a relationship between pain, arthritis, and changes in foot pressure.36-40 Most have focused on peak regional pressures or pressure-time integral, but few have looked at the loading pattern during gait. One way to assess the loading pattern over the entire gait cycle is using a Center of Pressure (COP) trace. This is a calculated measurement based on foot-ground contact area and magnitude of pressure for each pressure sample taken during the gait cycle. For example, if a donut were sitting on the pressure plate, the calculated center of pressure would be at the center of the hole, within the ring where there is no contact. It would be logical to conclude that if a deviation in foot position altered the ground reaction force vector then there would be a corresponding alteration in the plantar foot pressure pattern. This is fairly evident in a statically assessed limb with a varus alignment, where there is more pressure under the plantar aspect of the lateral foot.41 Our research concluded that indeed subjects with medial knee OA had a more lateral COP trace during gait than matched controls.42 Moreover, there was a statistically significant correlation between increased pain and and a more lateral deviation in the center of pressure trace. 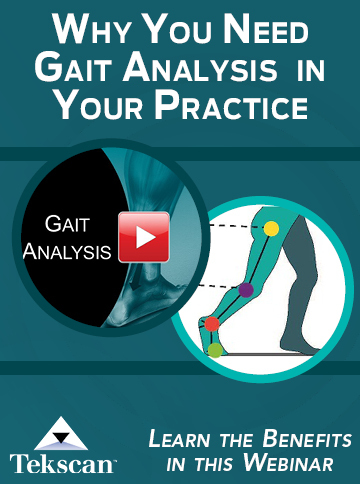 This study showed that those with medial knee OA have a deviated foot ground interface that can be measured with a clinical gait test. It would also seem logical that a treatment, such as an orthosis, footwear, or surgical procedure, that altered the COP trace in a medial direction would benefit those who suffer from medial knee OA. This, however, needs more studies before we can have a definitive answer. Several years ago, when this author proposed evaluating plantar pressure in knee OA, it was decided that barefoot kinetics and kinematics would be needed to compare to the pressure data. When data started to demonstrate that barefoot walking produced the greatest reduction in peak knee adduction moment compared to various shoes, orthoses, and braces, the concept seemed counterintuitive to a biomechanist. Most assumed it would be higher since when one walks across a force plate barefoot, greater shock is felt at initial contact compared to a shod condition. But even when the researchers accounted for body weight, height, speed, and step and stride length, the data showed that barefoot walking was associated with the greatest reductions in load.43 This took the work into an area that even today is controversial. That is: What is it about shoes versus barefoot that produces these differences? Figure 3. Arthritis shoe with orientation of outsole cuts creating flexure zones, which allow the shoe to "break way" at key periods of the gait cycle. This creates a less efficient lever arm to transfer the ground reaction force vectors to the next proximal joint segment. If shoe construction was to blame for increased loads on the lower extremity, then shoe construction should be able to reduce the loads. 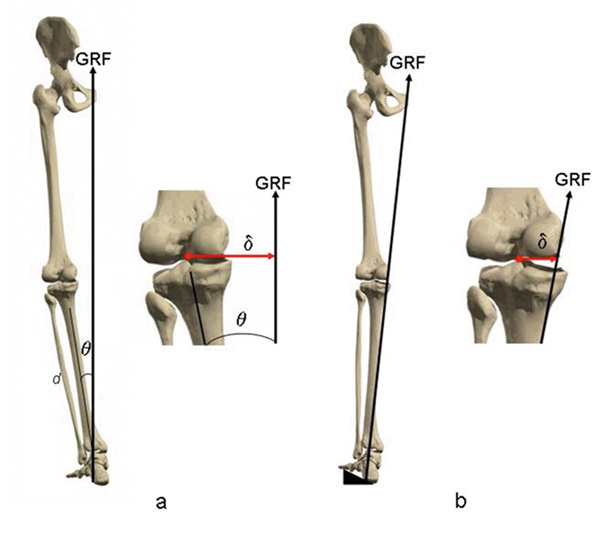 This author evaluated the magnitude and location of the external ground reaction force vector at each part of the stance phase of the gait cycle to assess how they could be altered. For example, at initial heel contact, the ground reaction force vector is posterior and lateral to the heel, pointing toward the center of mass of the body. It is therefore applying an external pronation moment to the ankle and subtalar joints; extension, internal rotation and adduction moments at the knee; and flexion, adduction, and internal rotation moments at the hip. All of these external moments have to be counteracted by the internal muscle moments. So if one wanted to reduce these moments, one could decrease the lever arm between the posterior-lateral heel and the rotational center of each segment by decreasing the size and thickness of shoe material at the heel. Of course there is only so much that can be reduced external to the body before contact is made at the surface of the heel. Another factor that could be manipulated is the property of the shoe sole material; it can be made soft and compressible, thereby making it an inefficient lever arm. The final way to manipulate the GRF is to have the shoe essentially “break away;” that is, have the contact surface point move as it makes contact with the ground. When this happens, the moment arm becomes less efficient at transferring the load to the next segment and the orientation of the vector can even be slightly altered. 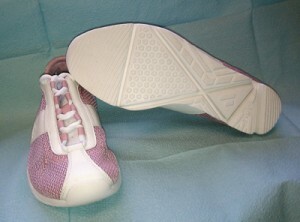 The end result of these experiments was a shoe designed at Rush University with a modified outsole and midsole based on the above described examples. 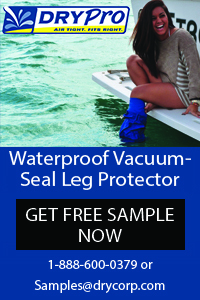 The design was tested in subjects with knee OA, with the results very similar to barefoot walking moments.44 The shoe continues to be evaluated at major universities in the U.S. and U.K. in the treatment of medial knee osteoarthritis. Researchers have continued to show that stability shoes produced higher moments while flexible shoes and even minimal shoes like flip flops produced less loads across lower extremity joints.45-47 This opened up the flood gates to marketing “barefoot” shoes from manufacturers who were trying to understand the implications of this work. However an observation from the knee OA intervention studies conducted at Rush supports the neuromuscular adaptation theory. In most cases there was an immediate reduction in the external knee adduction moment with the introduction of the mechanical intervention. But the studies also showed a sustained reduction in knee adduction moments or shift in the center of pressure over time even when subjects walked without the intervention. The important point here is that when the mechanical device was removed, the body continued to function as if the intervention was still there. The most logical explanation is neuromuscular adaptation. It is entirely likely that, as in the case of valgus wedge research, individual biomechanics will dictate which patients with medial knee OA will benefit from a simulated barefoot condition and which will need a more supported stable foot structure. Hopefully research will continue to provide us with more clues. But we all must keep in mind that research only provides us with pieces of truth. It is up to us to assimilate the information. Roy H. Lidtke DPM, CPed, FACFAOM, is an associate professor of podiatric medicine at Des Moines University in Des Moines, IA; an assistant professor of internal medicine, section of rheumatology, at Rush University Medical Center in Chicago; and director of the Center for Clinical Biomechanics at St. Luke’s Hospital in Cedar Rapids, IA. 1. Lawrence RC, Felson DT, Helmick CG, et al. Estimates of the prevalence of arthritis and other rheumatic conditions in the United States. Part II. Arthritis Rheum 2008;58(1):26-35. 2. Dillon CF, Rasch EK, Gu Q, Hirsch R. Prevalence of knee osteoarthritis in the United States: arthritis data from the Third National Health and Nutrition Examination Survey 1991–1994. J Rheumatol 2006;33(11):2271-2279. 3. Jordan JM, Helmick CG, Renner JB, et al. Prevalence of knee symptoms and radiographic and symptomatic knee osteoarthritis in African Americans and Caucasians: The Johnston County Osteoarthritis Project. J Rheumatol 2007;34(1):172-180. 4. Felson DT, Naimark A, Anderson J, et al. The prevalence of knee osteoarthritis in the elderly. The Framingham osteoarthritis study. Arthritis Rheum 1987;30(8):914-918. 5. Buckwalter JA, Saltzman C, Brown T. The impact of osteoarthritis. Clin Orthoped Relat Res 2004;427S: S6–S15. 6. Lethbridge-Cejku M, Helmick CG, Popovic JR. Hospitalizations for arthritis and other rheumatic conditions: Data from the 1976 National Hospital Discharge Survey. Medi Care 2003;41(12):1367-1373. 7. Gabriel SE, Crowson CS, Campion ME, et al. Direct medical costs unique to people with arthritis. J Rheumatol 1997;24(4):719-725. 8. Maetzel A, Li LC, Pencharz J, et al. The economic burden associated with osteoarthritis, rheumatoid arthritis, and hypertension: a comparative study. Ann Rheum Dis 2004;63(4):395-401. 9. Barrios JA, Higginson JS, Royer TD, Davis IS. Static and dynamic correlates of the knee adduction moment in healthy knees ranging from normal to varus-aligned. Clin Biomech 2009;24(10):850-854. 10.Miyazaki T, Wada M, Kawahara H, et al. Dynamic load at baseline can predict radiographic disease progression in medial compartment knee osteoarthritis. Ann Rheum Dis 2002;61(7):617-622. 11. Tanamas S, Hanna FS, Cicuttini FM, et al. Does knee malalignment increase the risk of development and progression of knee osteoarthritis? A systematic review. Arthritis Rheum 2009;61(4):459-467. 12. Sharma L, Song J, Dunlop D, et al. Varus and valgus alignment and incident and progressive knee osteoarthritis Ann Rheum Dis 2010;69(11):1940-1945. 13. Andriacchi TP, Johnson TS, Hurwitz DE, Natarajan RN. Musculoskeletal dynamics, locomotion and clinical applications. In: Mow VC, Huiskes R, eds. Basic orthopedic biomechanics. 3rd ed. Philadelphia: Lippincott-Raven; 2005: 106. 14. Prodromos CC, Andriacchi TP, Galante JO. A relationship between gait and clinical changes following high tibial osteotomy. J Bone Joint Surg Am 1985;67(8):1188-1194. 15. Wang JW, Kuo KN, Andriacchi TP, Galante JO. The influence of walking mechanics and time on the results of proximal tibial osteotomy. J Bone Joint Surg Am 1990;72(6):905-909. 16. Baliunas AJ, Hurwitz DE, Ryals AB, et al. Increased knee joint loads during walking are present in subjects with knee osteoarthritis. Osteoarthritis Cartilage 2002;10(7):573-579. 17. Miyazaki T, Wada M, Kawahara H, et al. Dynamic load at baseline can predict radiographic disease progression in medial compartment knee osteoarthritis. Ann Rheum Dis 2002;61(7):617-622. 18. Sharma L, Hurwitz DE, Thonar EJ, et al. Knee adduction moment, serum hyaluronan level, and disease severity in medial tibiofemoral osteoarthritis. Arthritis Rheum 1998;41(7):1233-1240. 19. Wada M, Imura S, Nagatani K, et al. Relationship between gait and clinical results after high tibial osteotomy. Clin Orthop Relat Res 1998;354(9):180-188. 20. Block JA, Shakoor N. The biomechanics of osteoarthritis: implications for therapy. Curr Rheumatol Rep 2009;11(1):15-22. 21. Block JA, Moisio K, Wimmer MA, et al. Wedged orthotics provide sustained mechanical unloading in medial knee OA. Presented at the annual meeting of the American College of Rheumatology, San Diego, November 2005. 22. Kerrigan DC, Lelas JL, Goggins J, et al. Effectiveness of a lateral-wedge insole on knee varus torque in patients with knee osteoarthritis. Arch Phys Med Rehabil 2002;83(7):889-893. 23. van Raaij TM, Reijman M, Brouwer RW, et al. Medial knee osteoarthritis treated by insoles or braces: a randomized trial. Clin Orthop Relat Res 2010;468(7):1926-1932. 24. Butler RJ, Marchesi S, Royer T, Davis IS. The effect of a subject-specific amount of lateral wedge on knee mechanics in patients with medial knee osteoarthritis. J Orthop Res. 2007;25(9):1121-1127. 25. Barrios JA, Crenshaw JR, Royer TD, Davis IS. Walking shoes and laterally wedged orthoses in the clinical management of medial tibiofemoral osteoarthritis: a one-year prospective controlled trial. Knee 2009;16(2):136-142. 26. Butler RJ, Barrios JA, Royer T, Davis IS. Effect of laterally wedged foot orthoses on rearfoot and hip mechanics in patients with medial knee osteoarthritis. Prosthet Orthot Int 2009;33(2):107-116. 27. Hinman RS, Bennell KL. Advances in insoles and shoes for knee osteoarthritis. Curr Opin Rheum 2009;21(2):164-170. 28. Pham T, Maillefert JF, Hudry C, et al. Laterally elevated wedged insoles in the treatment of medial knee osteoarthritis. A two-year prospective randomized controlled study. Osteoarthritis Cartilage 2004;12(1):46-55. 29. Baker K, Goggins J, Xie H. A randomized crossover trial of a wedged insole for treatment of knee osteoarthritis. Arthritis Rheum 2007;56(4):1198-1203. 30. Wimmer MA, Thorp LE, Foucher KC, et al. Effect of lateral wedged orthoses on external knee adduction moments in medial knee OA – a long-term study. Arthritis Rheum 2008;58(Suppl):Abstract 197:S240. 31. Lidtke R, Wimmer MA, Foucher KC, Block JA. The role of rearfoot mobility in the long term response to wedge orthoses in medial knee OA. Presented at the annual meeting of the American College of Rheumatology, Boston, November 2007. 32. Segal NA, Foster NA, Dhamani S, et al. Effects of concurrent use of an ankle support with a laterally wedged insole for medial knee osteoarthritis PM R. 2009;1(3):214-222. 33. Reilly K, Barker K, Shamley D, et al. The role of foot and ankle assessment of patients with lower limb osteoarthritis. Physiotherapy. 2009;95(3):164-169. 34.Franz JR, Dicharry J, Riley PO, et al. The influence of arch supports on knee torques relevant to knee osteoarthritis. Med Sci Sports Exerc 2008;40(5):913-917. 35. Thorp LE, Wimmer MA, Block JA, et al. Bone mineral density in the proximal tibia varies as a function of static alignment and knee adduction angular momentum in individuals with medial knee osteoarthritis. Bone 2006;39(5):1116-1122. 36. Van Gheluwe B, Dananberg HJ, Hagman F, Vanstaen K. Effects of hallux limitus on plantar foot pressure and foot kinematics during walking. J Am Podiatr Med Assoc 2006;96:428-436. 37. Zammit GV, Menz HB, Munteanu SE, Landorf KB. Plantar pressure distribution in older people with osteoarthritis of the first metatarsophalangeal joint (hallux limitus/rigidus). J Orthop Res 2008;26(12):1665-1669. 38. Schmiegel A, Rosenbaum D, Schorat A, et al. Assessment of foot impairment in rheumatoid arthritis patients by dynamic pedobarography. Gait Posture 2008;27(1):110-114. 39. Tuna H, Birtane M, Tastekin N, Kokino S. Pedobarography and its relation to radiologic erosion scores in rheumatoid arthritis. Rheumatol Int 2005;26(1):42-47. 40. van der Leeden M, Steultjens M, Dekker JH, et al. Forefoot joint damage, pain and disability in rheumatoid arthritis patients with foot complaints: the role of plantar pressure and gait characteristics. Rheumatology 2006;45(4):465-469. 41. Maly MR, Culham EG, Costigan PA. Static and dynamic biomechanics of foot orthoses in people with medial compartment knee osteoarthritis. Clin Biomech 2002;17(8):603-610. 42. Lidtke RH, Muehleman C, Kwasny M, Block JA. Foot center of pressure and medial knee osteoarthritis. J Am Podiatr Med Assoc 2010;100(3):178-184. 43. Shakoor N, Block JA. Walking barefoot decreases loading on the lower extremity joints in knee osteoarthritis. Arthritis Rheum 2006;54(9):2923-2927. 44. Shakoor N, Lidtke RH, Sengupta M, et al. Effects of specialized footwear on joint loads in osteoarthritis of the knee. Arthritis Rheum 2008;59(9):1214-1220. 45. Shakoor N, Sengupta M, Foucher KC, et al. Effects of common footwear on joint loading in osteoarthritis of the knee. Arthritis Care Res 2010;62(7):917-923. 46. Kerrigan DC, Franz JR, Keenan GS, et al. The effect of running shoes on lower extremity joint torques. PMR 2009;1(12):1058-1063. 48. Robbins S, Waked E, Allard P, et al. Foot position awareness in younger and older men: The influence of footwear sole properties. J Am Geriatr Soc 1997;45(1):61-66. 49. Robbins S, Waked E, Krouglicof N. Improving balance. J Am Geriatr Soc 1998;46(11):1363-1370. 50. Nurse MA, Hulliger M, Wakeling JM, et al. Changing the texture of footwear can alter gait parameters. J Electromyogr Kinesiol 2005;15(5):496-506.